Refract means bending. The bending of ray of light when it pass from one medium to another medium is known by a term called refraction. Refraction of Light happens due to different speed of light in different medium. 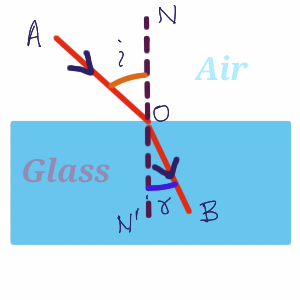 Speed of light in air is 3x10⁸m/s and that of in glass is 2x10⁸m/s. Refraction of Light: It can be defined as the change in the direction of light when it passes from one medium to another medium obliquely. A transparent substance in which light can travel is called a medium. For example Air, water, glass, kerosene etc are the transparent substances in which light can travel.